The best advice that you’ve probably never taken is to hire people to do the work for you. I’m guilty of it too, for two reasons. One, having people work in your business is like hiring a nanny to raise your kid. It’s hard to find people you can trust to do a good job. Two, employees are way more expensive than you think. To figure out the real cost of an employee, I took a look at 20 of the world’s largest companies to see how much they’re spending per employee. I determined cost of running a company per employee by dividing their operating expenses by the number of employees. To calculate the operating expenses, I subtracted their operating income from their total revenue. I found all of these numbers on Yahoo! Finance. Yahoo! gets their stats from the Form 10-K’s that these companies file quarterly because they’re publicly traded. These are the latest stats for these companies over the last year as of March 31st or April 30th, depending on their fiscal year. 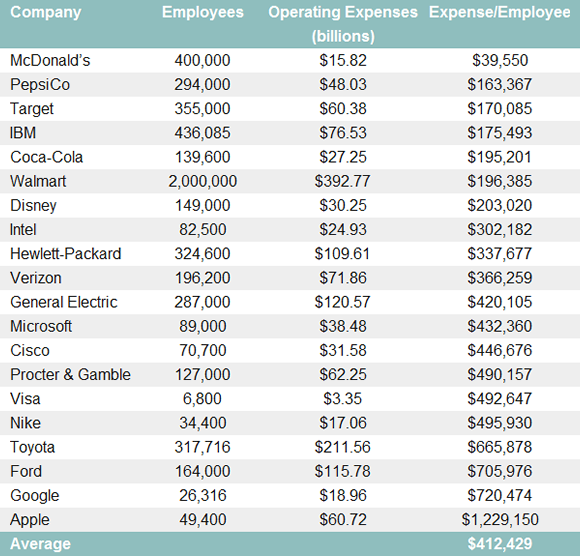 It’s hard to believe that McD’s spends four times less per employee than the next cheapest company on this list, but somehow they do. I even checked their 10-K and recalculated, twice. The lesson? Create jobs that can be filled with inexpensive labor and refine every process into a repeatable system. It’s not like every Apple employee walks away with a cool million at the end of the year. Rather, Jobs creates a culture that costs $1.2 million per employee to maintain. The lesson? To hire the most talented people in the world, you have to spend more than any other company in the world. By the way, Steve Jobs has a $1 salary. Cool, huh?! The point IS NOT that you should be paying your employees $400K per year. Rather, for every employee you have, there are lots of other places you should be spending money to grow your company. In fact, most of that $400K is overhead and costs of goods sold. Take these costs into consideration and adjust your prices accordingly. And if you’re thinking, “Oh these are just for the big guys… Doesn’t really apply to me.” Last week I talked to the CEO of a $6.5 million company with 50 employees. If we assume a 10% profit margin, the cost per employee still comes out to $117,000. Smaller companies spend less per employee, but $100K is still a lot of money. If you liked this post, “Like” it below. In fact, now that both Bing and Google display search results partly based on what your friends like, you should get in the habit of liking everything that you like..
Ah… That’s the trouble with tables. I turned it into an image and it should show now. I was thinking a bit about your business when I was writing this, Emil. Your formula is flawed. Expense per employee is not revenue – income / employees. You have companies like Walmart that buys things at $1 and sell at $1.09 sometimes. You cannot take that $1 and consider that as an expense for an employee. That’s an expense for merchandise or capital. Hey Badhohn… The point I was trying to make with this article is the fact that Wal-Mart needs to make $200,000 in extra revenue to afford another employee. I see how the headline is misleading. Perhaps I should’ve been more clear within the content. Nick and I talked to 25 of the world's top, most inspirational young entrepreneurs ages 12-23. Now we want to share their secrets with you. To check out the book, click here. To read what we're all about, click here. 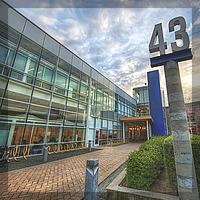 Home · About · Contact · Get Started with Entrepreneurship!